Methods: A retrospective review of patients with end ileostomies and colostomies was performed at a university hospital from 1999-2005. Demographic, clinical and outcome data was collected. Data were analyzed using Anova analysis of variance, t-test and descriptive statistics. Mantel-Haenstel chi-square was used to establish association. Results: There were 97 patients, 49 females with a mean age of 61 years and BMI of 26. Colostomies were created in 7%(n=7) of patients for fistulae, 31%(n=30) for malignancy, 34%(n=33) for inflammation or infection, 3%(n=3) for bowel obstruction, 21%(n=20) for perforation, volvulus, ischemia, bleeding, decubitus ulcers, or dysmotility. Ascending, transverse, and descending colostomies were performed in 2%(n=2), 13%(n=12), and 27%(n=26) of patients, respectively. End ileostomies were created in 2%(n=2) of patients. Sigmoid colostomies were created in 30% (n=29), while loop ileostomies were created in 26% (n=25). Follow-up was available in 61(63%) patients; 19 are confirmed dead. 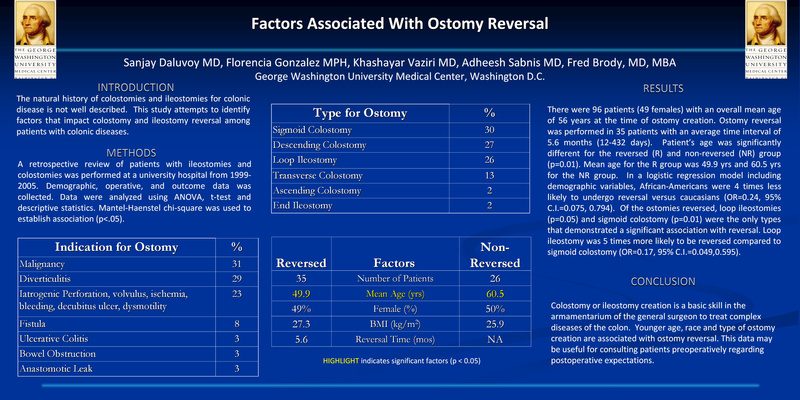 Ostomy reversal was performed in 35 patients with an average time interval of 3-6 months. Patient’s age was significantly different for the reversed (R) and non-reversed (NR) group (p=0.01). Mean age for the R group was 54.6yrs, while for NR group was 65.9yrs. No significant difference existed in gender or BMI. Patients with loop ileostomies (p=0.05) or sigmoid colostomies (p=0.01) showed a significant difference in reversal, as well. Surgical indication or past medical history did not dictate reversal. Conclusions: Colostomy or end ileostomy creation is a basic skill in the armamentarium of the general surgeon to treat complex diseases of the colon. While age and type of ostomy creation are significant predictors for reversal, indication for surgery and past medical history are not. This data may be useful for consulting patients preoperatively regarding postoperative expectations.